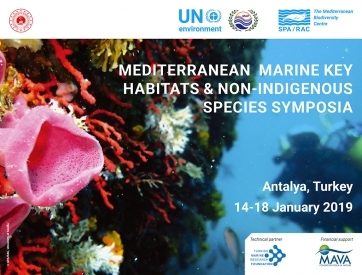 Scientists and researchers from all over the Mediterranean will meet in Antalya from 14 to 18 January 2019 to exchange knowledge on marine biodiversity conservation and enhance cooperation to achieve the good environmental status of the Mediterranean Sea. The symposia will be opened officially by Mr Ahmet DEMIRTAS, General Director - Ministry of Environment and Urbanization, after the welcome speech of Mr Khalil ATTIA, SPA/RAC Director, on behalf of Mr Gaetano LEONE, MAP Coordinator. During the opening session, a presentation on the Mediterranean Key Habitats and NIS in Turkey will be provided by Professor Bayram ÖZTÜRK, president of TUDAV, followed by the screening of the documentary film “Mediterranean Sea and Biological Invasion”, produced by Turkish Radio and TV. The symposia aim essentially at providing an opportunity to exchange the most recent scientific data on marine biodiversity conservation while promoting the cooperation between specialists working on the Mediterranean. Key note conferences, oral communications, poster sessions and round tables will be organized to present the most recent studies dealing with marine key habitats and species introduction in the Mediterranean, and to discuss the best strategies of biodiversity conservation and restoration in the Mediterranean Sea. “The symposia will also be a good opportunity to discuss new topics such as the monitoring, the definition of Good Environmental Status in the Mediterranean and to strengthen links between scientists and scientific institutions”, says Khalil ATTIA, SPA/RAC Director. The Mediterranean symposia on marine key habitats and non-indigenous species is financed by the MAVA Foundation and the Mediterranean Trust Fund. During the symposia, a photographic exhibition on marine habitats and non-indigenous species will be held at the conference venue and will offer the visitors the opportunity to enjoy the wonderful Mediterranean underwater world.